Sorry, there is no products in this category. With most major TV brands around the world always striving to produce the best viewing experience possible for customers, it comes as no surprise that 8K TVs are now hitting the market. If you’re looking for the best viewing experience possible, our 8K TV deals are not to be missed, with new deals being added each week. What’s the Difference Between 4K and 8K? 8K TVs have four times the number of pixels that 4K sets possess and boast a resolution of 7860 x 4320. That includes 33 million pixels, compared to 4K’s 8 million pixels, which means that your viewing experience is greatly enhanced. Customers looking for 8K TV deals will also find that they possess a frame rate of up to 120 Hz, while 4K sits at around 50-60 frames per second. This means that 8K TVs offer the user a more natural-looking motion when watching movies or playing computer games. The final major difference is the viewing angle each TV offers. The viewing angle is the maximum angle at which people can view the screen with acceptable visual display on the monitor. 4K offers a respectable 55-degree viewing angle, while 8K offers a horizontal 100-degree viewing angle. This is not to say that our selection of cheap 4K TVs are not up to standard, quite the opposite. 4K TVs offer a fantastic viewing experience and will continue to do for many years to come. However, if you’re looking for the best possible TVs on the market today, be sure to pick up one of our 8K TV deals today. How Are We Able to Offer These Fantastic 8K TV Deals? Our products are all bought from high street retailers who can no longer sell their merchandise due to a number of reasons. The TVs we stock could be 30-day customer returns, end of line/discounted models, items with damaged packaging or surplus stock. 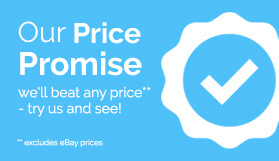 This allows us to offer our customers these items at significantly discounted prices. All TVs that we sell are put through testing by our in-house engineers to ensure they are fit for purpose before being sold. To show how confident we are in each and every product we sell, all of these great 8K TV deals carry a 12-month return-to-base warranty (unless otherwise stated). Electronic World are proud to offer the best prices on the very latest TV technology. Our aim is simple: to provide high-quality TVs from the world’s top brands to our customers at affordable prices. Don't ﬁnd what your looking for ? 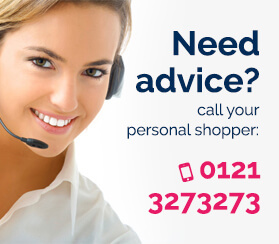 Our personal shoppers will be happy to use their vast knowledge and experience to provide you with advice on buying the best television for your exact needs and budget. Additionally, if you would like any more information about the cheap TV deals we offer, including our impressive smart HD TV deals, please don't hesitate to get in contact with our friendly team today. Enter your details and your friends details below to recommend us. Enter your phone number or mobile number below, and we will get back to you shortly. Enter your details below to receive our newsletter. - Not all items are available for home delivery, however, for example plasma televisions due to weight restrictions and clearance items. Items available for home delivery will have the 'delivery available' icon visible on the specific product page just above the price. - You can pay in full online and follow the steps on the website, charges will be added to your order when 'standard delivery' option is selected. - Alternatively, you can pay in full over the phone via our sales team available on 0121 769 2623. - Delivery can take a minimum of 2 working days, depending on stock availability. Please note: We can only deliver to the card billing address for security reasons. If delivery address and card address do not match we may ask to see ID to confirm your identity and/or address. This can be done by via email. - Click on "Buy Now" which will take you to the shopping basket. Follow the details online. - You will be asked to select 1 of the 6 Electronic World depots from where you would like to collect your TV (see the 'Store Locator' on the bottom right corner of the website for more details on the 6 Electronic World locations). - Follow the step by step payment pages to complete your order. - We will transfer your TV free of charge to your chosen Electronic World depot and will telephone you to arrange a mutually convenient time for you to collect your purchase. You should take the card you paid with, and proof of name and address details with you when you go to collect (driving license/house bill/bank statement). The TV will be demonstrated to you and then it is yours to take away! Please note: Failure to produce the card and relevant ID means we are unable to release goods on collection. - Ring our dedicated sales team on 0121 769 2623 (During office hours Monday-Saturday 9am-5.30pm) to pay a £50 deposit by credit/debit card over the phone. This will reserve the TV for you. - We will transfer the TV free of charge to your choice of Electronic World depot and will telephone you to arrange a mutually convenient time for you to collect your purchase. Please note your credit/debit card WILL NOT BE CHARGED until we have arranged the transfer of the TV to your chosen Electronic World branch. We DO NOT charge for items that are out of stock until the item is in stock and arrangements for collection have been made. 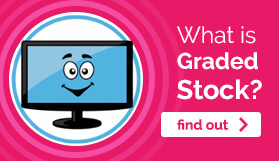 "Graded" televisions are items that High Street retailers can't sell on for various reasons. This may be because the TVs are surplus stock, end of line/discontined models, 30 day customer returns, unwanted gifts, or items with damaged packaging. When the TVs come into us at Electronic World they are technically tested, processed, repackaged and offered for sale. Before sale, all televisions undergo a comprehensive quality control process by our engineers. In the majority of cases the item will be supplied with its original packaging and will be "as new" - the items we sell are not used. If the original packaging is not supplied we will supply other secure packaging to keep the TV well protected in transit. All TVs sold on this website carry a 12 month 'return to base' warranty provided by ourselves (unless otherwise stated). Our guarantee on all of our products demonstrates our confidence in each and every product we sell. Upon collection the TV is unwrapped and you are given a demonstration of the TV for your peace of mind. This really is an amazing way to save hundreds off "Brand New" prices without sacrificing any of the quality or performance!